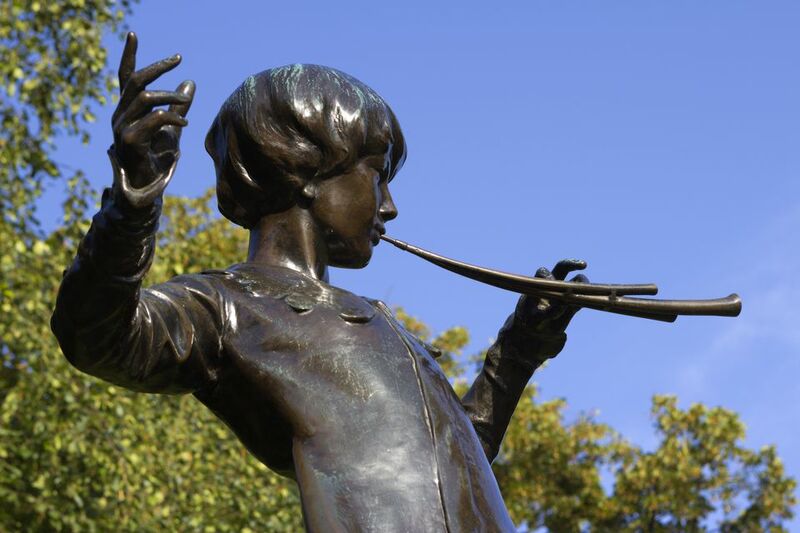 The bronze statue of Peter Pan is located in Kensington Gardens, next to Hyde Park. The exact location was chosen by Peter Pan's author, J.M. Barrie. Barrie lived close to Kensington Gardens and published his first Peter Pan story in 1902, using the park for inspiration. In his Peter Pan tale, The Little White Bird, Peter flies out of his nursery and lands beside the Long Water lake, on the spot where the statue now stands. Barrie began planning the Peter Pan statue in 1906. He took photos of the six-year-old Michael Llewelyn Davies (the inspiration for the Peter Pan character) wearing a special Peter Pan costume to help a sculptor recreate his vision. In 1912, he found the man to make the statue, Sir George Frampton, and by May 1 that year the sculpture was in place in Kensington Gardens. The nearest tube station is Lancaster Gate on the Central Line. Use Journey Planner to plan your route by using London public transport. Come out of the station on Bayswater Road, turn right and walk to the traffic lights. Cross Bayswater Road (the main road) and enter Kensington Gardens, with the Italian Gardens straight ahead. Walk to the right of the Italian Gardens and on your right, you will see this lovely fountain, previously used by cattle and horses. It still works and offers clean drinking water. Continue along the path on the right of the Italian Gardens which then runs next to Long Water. A few minutes walk along this path will bring you to the Peter Pan statue on your right. "There is a surprise in store for the children who go to Kensington Gardens to feed the ducks in the Serpentine this morning. Down by the little bay on the south-western side of the tail of the Serpentine they will find a May-day gift by Mr J.M. Barrie, a figure of Peter Pan blowing his pipe on the stump of a tree, with fairies and mice and squirrels all around. It is the work of Sir George Frampton, and the bronze figure of the boy who would never grow up is delightfully conceived. In this bronze statue, Peter Pan is standing on a tree trunk covered with climbing squirrels, rabbits, and mice. This photo shows you the rabbits towards the bottom of the sculpture. Peter Pan is standing on a tree trunk watched by animals of the English countryside and delicate winged fairies. This photo shows you the fairies around the middle of the sculpture.